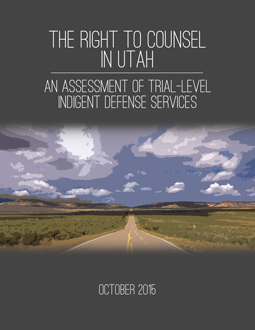 On October 26, 2015, the Utah Judicial Council (UJC) – the policy-arm of the judicial branch of government – received and adopted a report from the UJC’s Study Committee on the Representation of Indigent Criminal Defendants in Trial Courts, setting forth legislative and other recommendations to improve the right to counsel in that state. The adoption of the report makes the recommendations official policy of the UJC. The report includes an appendix with draft legislative language for consideration in the 2016 session, including the creation of a statewide indigent defense commission to provide statewide oversight of indigent defense services and to promulgate standards and to provide training, economic assistance, and other resources to local jurisdictions to meet constitutional obligations for indigent defense. Standards required to be promulgated include, among others: a) defender independence; b) non-conflicted representation; c) early appointment of counsel; d) banning flat fee contracts; e) attorney qualification and training; f) workload controls; g) continuous representation by the same attorney; and, h) supervision. The 6AC will keep you posted on the progress!